We’d love your help. Let us know what’s wrong with this preview of Getting to Maybe by Frances R. Westley. Many of us have a deep desire to make the world around us a better place. But often our good intentions are undermined by the fear that we are so insignificant in the big scheme of things that nothing we can do will actually help feed the world's hungry, fix the damage of a Hurricane Katrina or even get a healthy lunch program up and running in the local school. We tend to think that great social change is the province of heroes - an intimidating view of reality that keeps ordinary people on the couch. But extraordinary leaders such as Gandhi and even unlikely social activists such as Bob Geldof most often see themselves as harnessing the forces around them, rather than singlehandedly setting those forces in motion. The trick in any great social project - from the global fight against AIDS to working to eradicate poverty in a single Canadian city - is to stop looking at the discrete elements and start trying to understand the complex relationships between them. By studying fascinating real-life examples of social change through this systems-and-relationships lens, the authors of Getting to Maybe tease out the rules of engagement between volunteers, leaders, organizations and circumstance - between individuals and what Shakespeare called "the tide in the affairs of men." 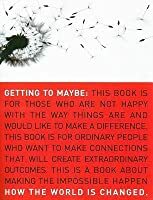 To ask other readers questions about Getting to Maybe, please sign up. Can I read this online? The moment you quote Mary Oliver's poem "Wild Geese" and try to act like it's about the momentum of social movements is the moment I stop reading your book and throw it at the bleeping wall. Inspiring discussion of social change as force for transformation. I recommend this for all social innovators, visionaries and anyone interested in creating or transitioning change in the world today. Well presented, written and articulated with numerous appropriate examples to encourage and inspire passionate engagement where ever one has juice. from the notes "While traditional evaluation judges mistakes and unattained objectives as failures, developmental evaluation treats them as learning op Inspiring discussion of social change as force for transformation. I recommend this for all social innovators, visionaries and anyone interested in creating or transitioning change in the world today. Well presented, written and articulated with numerous appropriate examples to encourage and inspire passionate engagement where ever one has juice. from the notes "While traditional evaluation judges mistakes and unattained objectives as failures, developmental evaluation treats them as learning opportunities and chances to make corrections or to take a new path. The only real failure is the failure to learn Accountability shifts from compliance to learning: not just any learning, but learning that bears the burden of demonstrating that it can, does and will inform future action." Great book on social innovation! So many interesting stories from both the private and public sectors. This book sparked insightful conversations on both my personal and professional life. This book got me dreaming, sombre, critical, hopeful, wondering and focused all at the same time..
And I do think that is what it was going for. Being a social innovator is a different way of living. You live and survive on this undying belief in a certain way of life. Where most people say, “this is not right” as a social innovator you ask what can I do about it. That is where the beautiful trap is. The trap of a goal to change things but not really knowing exactly how to make it work. And it doe This book got me dreaming, sombre, critical, hopeful, wondering and focused all at the same time..
That is where the beautiful trap is. The trap of a goal to change things but not really knowing exactly how to make it work. And it does have added complexities I think compared to your business which just goes for the bottom line. As an innovator, you actively trying to do good, right which opens you up to a can of worms and challenges. And I do feel Westley and co really did well to capture that experience and reality. Its broadness might annoy some readers who might feel it doesn’t go into detail about specific problems they face. What we can get though is realizing that there is a whole community of social innovators out there, all at different stages and this book is for the family of innovators. In conclusion, I’ll place some of my favorite quotes, that also seek to the main themes found in the book. I highly recommend it to innovators out there. A few notes. This book deals with more of the theory and explanation of how social progress takes hold opposed to practical specific advice. Which is completely reasonable in hindsight but I went into it expecting some more practical information. It's also written from a Canadian perspective and many of the examples are Canadian organisations. I had an incredibly hard time reading this book, my mind kept wandering as I read. But I'm giving it 5 stars because it appears to be a well constructed, w A few notes. This book deals with more of the theory and explanation of how social progress takes hold opposed to practical specific advice. Which is completely reasonable in hindsight but I went into it expecting some more practical information. It's also written from a Canadian perspective and many of the examples are Canadian organisations. Read for school but really enjoyed. This isn't a particularly difficult read and I was familiar with many of the complexity theory ideas that the authors talked about but I found the overall message of using passion, action and relationships to support social innovation was clear and the examples used contributed to a deeper learning. Developmental evaluation is MQP's thing and I think it was nicely woven in, although I would have liked to see a better explanation of what it really is. This is a five-star work related read that is deserves the rating for its role in enabling an accessible understanding of complexity, and how we can get to "maybe" on social issues. This may be one of the most enlightening books on social change I have read in a long time. The authors are long time activists and students of what they call "social innovation" which they describe in numerous ways are efforts to bring about significant transformation in commonly established practices. In the preface it says: "this book is for flawed people.... who are not happy with the way things are and would like to make a difference". The preface begins by describing former Czech president This may be one of the most enlightening books on social change I have read in a long time. The authors are long time activists and students of what they call "social innovation" which they describe in numerous ways are efforts to bring about significant transformation in commonly established practices. In the preface it says: "this book is for flawed people.... who are not happy with the way things are and would like to make a difference". The preface begins by describing former Czech president Vaclav Havel's concept of hope as "...a dimension of the spirit...[and]not the conviction that something will turn out well, but the certainty that something makes sense, regardless of how it turns out." The authors go on to explain the basic concepts and tenets of complexity theory and how it relates to social innovation. Their basic thesis is that people who want to make a positive difference in the world must be grounded in a strong sense of ethics and values, and be willing to enter into arenas of uncertainty where they neither control nor know all the forces at play in a given situation. What they control is their conviction to make a difference and what they know is that they are often dealing with systemic issues that react and respond in non-rational and surprising ways. They use real life examples of significant change like the 10 Point Coalition in Boston (which addressed gun violence) and Mothers Against Drunk Driving (which led the way in toughening drunk driving laws). Each chapter is prefaced with a poem that in some way illuminates the concepts they are trying to convey and illustrate. After the tumultuous year of 2016, it seems fitting that the first book I finished this year was Getting to Maybe. This is not the first time I have read this book. I read it for a class in my third year of university and I did not understand it at all. How was this book supposed to help people initiate social change? Why was everything described in metaphors? It was too vague, too unconnected to my life. It didn't provide answers, and it didn't inspire me, so I felt it was something of a failur After the tumultuous year of 2016, it seems fitting that the first book I finished this year was Getting to Maybe. This is not the first time I have read this book. I read it for a class in my third year of university and I did not understand it at all. How was this book supposed to help people initiate social change? Why was everything described in metaphors? It was too vague, too unconnected to my life. It didn't provide answers, and it didn't inspire me, so I felt it was something of a failure in that sense. But I kept it anyway. I'm at a different place in my life. I have been thinking a lot about how we give back to the world. What do we do to help each other? How do people devote themselves to leaving things better than they found it? There are a lot of issues I care about. But how does that translate into action (outside of social media likes or petitions)? Many uplifting stories here and much encouragement. Boiled down to less than the sum of its parts the message is this: Social change is hard, but the need for it never ends, so keep trying because change comes from the oddest places, and every helpful action, no matter how small, pushes in a positive direction. If enough snowflakes fall on a branch, it will bend and eventually break (or, not mentioned, the snowflakes will all slide off …). About reading the origin story of micro lending in Bangla Many uplifting stories here and much encouragement. Boiled down to less than the sum of its parts the message is this: Social change is hard, but the need for it never ends, so keep trying because change comes from the oddest places, and every helpful action, no matter how small, pushes in a positive direction. If enough snowflakes fall on a branch, it will bend and eventually break (or, not mentioned, the snowflakes will all slide off …). About reading the origin story of micro lending in Bangladesh: It is easy to get angry, but if you think about it, you start to wonder who you should be angry with. Were the money lenders creeps for charging so much interest that the basket weavers could only borrow for one day, with two cents left over to feed their family? Or were the money lenders also being squeezed by their sources? Is there no other work? Why charge interest at all? If the answer is ‘because of the risk of other borrowers defaulting,’ then you need to look at how much risk is being priced into each loan. Should money lenders be permitted to make a huge margin, or only enough to cover their costs and the default risk, or should we let ‘the market’ decide? If you point out the market is amoral, then you find that you are demonized on Fox News and in the WSJ for questioning the premise of capitalism. I was initially drawn to this book by a talk on complexity by Brenda Zimmerman that I watched on YouTube. I was hoping the book would expand on the topics discussed by Dr. Zimmerman, which I found very interesting. The book (co-authored by Zimmerman) does discuss Complexity Theory, but just briefly, in an initial chapter. The rest of the book is composed by a series of chapters that contain recommendations to social innovators and facilitators of social innovation (e.g. policy makers). I think th I was initially drawn to this book by a talk on complexity by Brenda Zimmerman that I watched on YouTube. I was hoping the book would expand on the topics discussed by Dr. Zimmerman, which I found very interesting. The book (co-authored by Zimmerman) does discuss Complexity Theory, but just briefly, in an initial chapter. The rest of the book is composed by a series of chapters that contain recommendations to social innovators and facilitators of social innovation (e.g. policy makers). I think the book is well written and contains a lot of interesting ideas. However, it failed to interest me enough to actually engage with those ideas. Wanna change something important? Read this first. 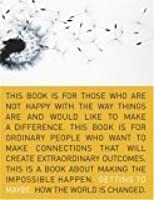 I love stories and this book provides a framework for engaging in what they call social innovation through the stories of people's successes and failures in trying to do the same. Some people everyone knows, others not. I'm still seeking to determine how this book is applicable to the big problems of racism, for instance, that span local or even national contexts. But I think they authors would say that is probably the wrong way to think about it Wanna change something important? Read this first. Yet another take on managing change in a complex world, this time from the vantage point of social entrepreneurs and activists. Complexity theory serves as a (metaphorical) background to illuminate and deepen concepts. The book is littered with case studies, the vast majority of them from a North American realm. There are some interesting bits on 'developmental evaluation', a theme that is elaborated in much more detail in Michael Quinn Patton's eponymous book. I'd give it 3,5 stars. A good companion book to books and reading material on systems theory and complexity theory. Lots of cases sited and examples which can be useful real world references. You will not learn systems theory or complexity theory by reading this book. It is more about how those theories are used in real world situations. I think this book would be a lot more valuable for someone who is actually trying to take an innovative non-profit idea off the ground. Otherwise, it presents a lot of interesting ideas in a very lose framework, and I found most of it difficult to retain. 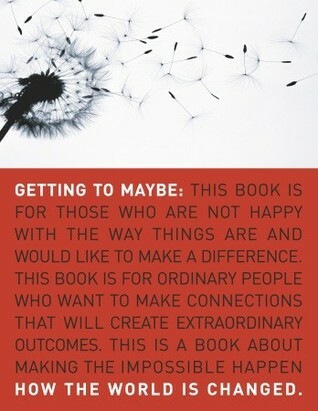 Getting to Maybe was a good, inspiring introduction to social innovation. I particularly found the stories used to explain complexity theory useful. It is a good summary and overview of social innovation and systems thinking. A bit longer than it needed to be, but lots of wonderful examples of how people bring about change by using not-the-usual tactics in highly complex situations where linear, strategic planning just doesn't work. Really enjoyed it, lots of good things to think about. Bits and pieces of inspiration for the community organizer, non-profit crowd. But structure is poor and the examples become unnecessary after awhile. Would have made a better essay than book. An interesting view of the motivations and challenges facing social innovators. Illustrates a great wasy to look at the differences between simple, complicated, and complex risks. This is one of my favorite all time "pop psych" books. I think about it all the time - also a fabulous introduction to chaos theory. Interesting, but only relevant if you're a philanthropist or leading a social welfare non-profit. People who feel called to change their little piece of the world are always inspiring to me! This book is filled with ideas of things that others can do to help in service to their communities. rocking my world. deep and sharp and gentle and inspiring. This was ok, ultimately not as empowering or helpful as I hoped. An easy intro to complexity theory and dealing with complex problems for those not familiar with the field. One of my all time favorite nonfiction books, I've read it several times. It speaks to my line of work and I find it quite inspirational. I really liked this book. Very well written, easy to understand and applicable. Inspirational and very, very helpful! Love it! Would recommend that everyone read it.